Many excellent junior results too! From Jamie Hutchinson... 7.5m point to point fell race from Wycoller Park over the moors to Haworth. 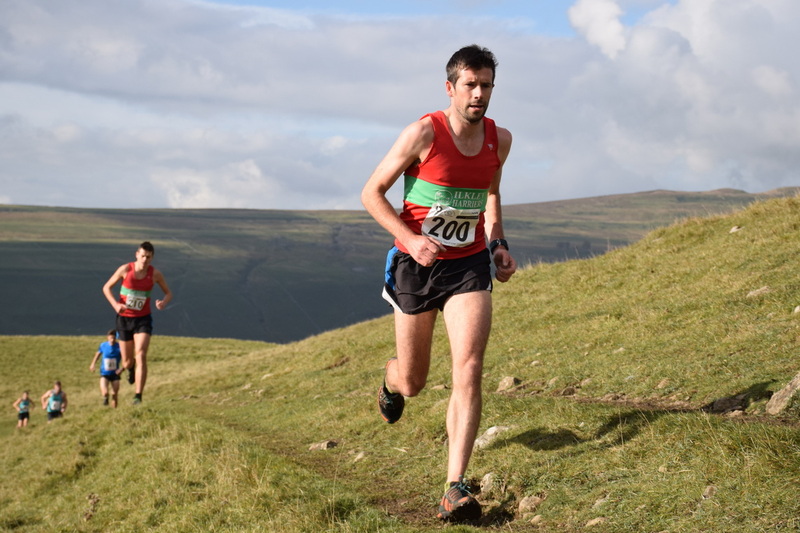 First time I'd tried the Bronte Way fell race, organised by KCAC, and I wasn't disappointed. Pre-entries had the option of getting the bus from Haworth out to Wycoller, whilst EODs had to make their own way. The course had a few climbs but nothing too drastic and conditions underfoot varied from tracks to a few boggy paths. I had a pretty strong run but just lacked a bit of speed on the last few miles into Haworth. Although this was a Harriers League race I think there were only two Harriers running. From Pauline Munro ... I've recently joined IH having previously run for Wetherby and before that Bingley for many years; just to let you know I won the women's race at the Sheffield 10km yesterday; not a super fast course - quite a hard course in fact with a steady and on occasion stiff, climb all the way to 6km. anyway I ran 37:52 and was 1st woman , 31st overall and first vet 45. I'm doing the Abbey Dash on Sunday and will be at the next XC all being well. From John Hayes ... Glentrool, Galloway, Scotland. It seems a long time ago when the Karrimor Mountain Marathon rebranded itself as the Original Mountain Marathon (OMM). The message was unambiguous:- We are the original event of this type and therefore the best. Times have changed over the years. For example I was surprised (disappointed even) to find TV screens and pop music at the Friday night marquee tent. But once the event itself got going it was the same as ever. Brilliantly organised with a range of challenging courses, the OMM tends to be located in tough terrain and usually has howling wind and rain to add to the "fun". This year the weather was kind although the early mist on Saturday caused some havoc. I was excited to be running in this area as about 40 years or so ago my dad Spike came 3rd in the Elite in the same area. I opted for the medium score with my brother in law Martyn Pegg and we were very happy with our 25th position overall. And any irritation I felt about the Friday night pop music dissipated as I woke at 6am on the Sunday to the sound of a bagpiper followed by a loud ripple of applause from the competitors in their soggy tents. From Petra Bijsterveld ... It was Michael Lomas' race report last year which inspired me to enter the Snowdonia Marathon. Regrettably Michael was not able to run it this year due to injury, so I was the only Harrier to toe the start line in Llanberis. Though with the green and red Harriers vest I fitted right in as of course many Welsh clubs sport these colours, and I got more shouts of 'da iawn' than 'well done' on my way round. The weather was overcast, with low cloud hiding much of the mountains from us initially, and an ideal running temperature of around 12 degrees. The course is a clockwise circuit of Snowdon, predominantly on road but with two rough track sections. The challenge is formed by having to negotiate 3 major climbs, 2744 feet in total on my Strava. The first climb starts 2 miles in and lasts for 2 miles to Pen y Pass, followed by a long descent to Beddgelert at mile 13. From there another 2 mile climb followed by a flattish section to Waunfawr at 22 miles. Now in every marathon the sting lies in the tail, but Snowdonia takes this to another level as you are presented by another steep climb for 2.5 miles, followed by an even steeper descent over just 1.5 miles down to the finish in Llanberis. I felt strong at the start and took the first two climbs steadily, and was able to make good progress on the downhill sections, reaching half way in 2.09. Miles 16 to 21 were the toughest mentally, my body started to hurt and wanted to walk, and I was actually looking forward to the final climb as I would finally allow myself to do just that. Obviously at the front end of the race people would be running that ascent, but around me 100% of folk were walking it. A man next to me bemoaned the fact that earlier in the week he had run up it 'easily' in one go. Yes, it is a different story altogether with 22 miles in the legs already. Reaching the top I had to use all my remaining will power to start running again, I felt quite dizzy and queasy and my quads were screaming. However, the prospect of finishing well within 5 hours made me launch myself down the hill and I managed to overtake lots of runners. One poor man must have been in so much pain he was actually trying to walk backwards! Entering Llanberis the support from the crowd was tremendous, there was a wall of sound on the approach to the finish line with people shouting your name and encouragement, and I was delighted to cross the line well within 5 hours and take receipt of my slate coaster. I spent a long time sitting in the queue for the sports massage, and when my turn came the experience was brutal, but it paid off as my legs feel very good today. My day had a perfect end as when I returned to my car in the short-stay car park the expected ticket had not materialised. The traffic warden must have appreciated my note in the windscreen apologising for not being able to run a sub-3 hour marathon. From Neil Bloor... I took on the hordes of midges of Macclesfield Forest for my first Duathlon to find it an interesting and demanding event. The first 7.5k run set off up steep forest tracks, before a series of wet flagstones up round the summit of Shutlingsloe hill, a steep grassy descent, challenging bogs and back down the forest tracks finishing on more undulating trails. The 17k cycle set off up the same steep tracks with 3 laps and a few hills that got everyone pushing. I lost some time down the 'technical' descent on the first two laps- a narrow rocky gully that challenged my nerves - but managed to remain upright into the third stage. After another steep start this was a comparatively easy 3.5k undulating run. Happy to find I was second v50 in 2:06. Winner: Simon Harding Macclesfield Harriers in 1:23. On Thursday 6th October the Club was presented with ourr renewed Clubmark status at one of the junior indoor Sportshall athletics sessions. Nick Settle, England Athletics' Club and Coach Support Officer for West and North Yorkshire presented the certificate to Hilda Coulsey and Shirley Wood, who led on the Clubmark process for the Club. An Ilkley team of Martyn Stocker, Jack Wood, Steve Turland, Mary Gibbons, Outi Kamarainen and Iain Gibbons travelled north to the beautiful hills of Luss and finished 68th out of 106 teams. From Jane McCarthy... Great conditions for running at the Plusnet Yorkshire Marathon this morning. Having decided to run the 10-mile course there was plenty of time to relax and enjoy watching the marathon finishers. There were excellent performances from the three Harriers racing the marathon distance, Derek Oliver a 5th place category finish, another PB just 2 weeks after Berlin for David Howe, and a massive 20 minute improvement by Helen Waddington, showing superb pacing throughout. From Dave Jepson ... Three Harriers - well, two and a temporarily lapsed member, completed the Royal Parks HM in London today (9th October), joining 16,000 others in near perfect running conditions: cool, sunny, and just a gentle breeze; dry and firm underfoot. Dave Jepson - in his first race for six years, ran a remarkably even 1:34'31"; John Woodward - still the best 'once a week, 14st plus, carthorse' in the club - cantered home in 1:48'25", bumping into Dave Ibbotson (1:49'55") on the home straight. A good course around the historic sites of central London, ending (as in the last 7 miles or so) with a mind-numbing zig-zag around Hyde Park. Great crowds, good water stations, and a fairly fast course - several tight turns notwithstanding - the race was won in 1:09'37" (first female in 1:21'08" - 57th finisher). The goody bag was nothing if not eclectic: basically a pick and mix stall masquerading as a food bank - your correspondent has never seen passata on offer before, and it's doubtless that it has ever shared a stand anywhere with chewy calcium tablets; chilli crisps; and cans of rhubarb enhanced apple juice - highly recommend the latter by the way. Amusing moment of the day came when Messers Woodward and Jepson decided to avail themselves of a couple of apparently discarded tops whist waiting otherwise damp and cold for the two other members of team Bradford Hide to rendezvous after the race, only to hear a vaguely foreign voice protest a few minutes later, 'those are my tops'. Olivia was remarkably understanding - though she was outnumbered! Fortunately our friends were delayed because otherwise I suspect we'd have been the subject of a diplomatic incident replayed on Crimewatch some time soon. From Andrew Merrick...In a moment of weakness on the Leeds canal towpath just before Christmas, I committed to a non-harrier running friend that I would run Lakes in a Day with him. There were times last Saturday when I regretted this but on balance it was a good day out, helped by good weather throughout and the pubs staying open until half past midnight. My sole objectives for the run was to get round with David and finish before the pubs closed - the latter was made more straightforward by the late closing times, I happily discovered on my arrival in Cartmel at 10:45pm, sadly without David who had had enough by the time we had got to the final checkpoint. For those considering a 50 mile adventure next year, I can report an interesting and challenging route. We took the option of the early morning coach from Cartmel to Caldbeck before an 8am start running North to South via a non-pathed route up Blencathra, and the 'entertaining' Halls Fell Ridge descent into Threlkeld, the first of only 3 feed stations. From there the challenging climb up Clough Head, along the Bob Graham route (ish) to Helvellyn and Fairfield before a second stop in Ambleside. At this point, 30 miles in, we were expecting a more gentle lake side run for most of the remaining mileage, however the wooded rooty trail was more challenging and hilly than we had expected and it became relatively slow and challenging going as it got dark. One more feed station before leaving David, as he reminded me, in pursuit of UTMB points over the remaining 8 miles. Sitting outside the pub in a very pleasant square in Cartmel, with a celebratory beer or two, cheering other runners on as they ran past to the finish, was unquestionably the highlight alongside the camaraderie and the hilltop views on a sunny lake district day. A challenging but well organised Ultra. From Sue Williamson ... Lucy Williamson had a fabulous run and came first lady in a time of 41:55 - she was thrilled to run "through the tape" and got some great prizes. From Alison Weston... A beautiful day for the Langdale horseshoe this year. Jack did a great time of 2:12 and Alison 3:15. Not seen official results yet but Jack was very well placed overall. From Andrew Sheldon ... 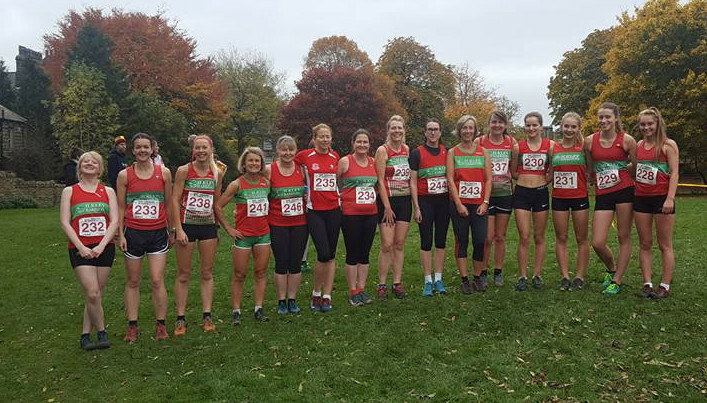 I took part in this 10k Trail Run at Aldridge Airport (country park), it was the first staging of this event by Birchfield Harriers, with proceeds going to the Aldridge Royal British Legion Poppy Appeal, and grass roots running. It was a well laid out cross country course, open grass field start and finish, tight turns and stiles amongst woodland paths. I was pleased with the time and looking forward to the next cross country on home turf. From Jack Wood ... An excellent 19th by Ilkley's Men at a sunny Hodgson Relays today. A great start by Martin & Gav who came back 8th on first leg. Steve and young Jack ran strongly on the long second over High Street. Iain and Paul stormed a 10th fastest leg 3 time, and me and Michael in his first ever Lakes fell race held on to a top 20 place. Well done all. Ilkley had 5th ladies team. From Petra Bijsterveld... This was my second go at the Kielder Marathon, part of a superbly organised weekend where you can choose between a run-bike-run, 10k, half or full marathon, all in the spectacular setting of Kielder Water. As in 2015 I was the only Harrier there, but the atmosphere is so friendly that it is easy to get chatting to lots of nice people. You can also hang out with the likes of Steve Cram and Alyson Dixon who support the event. The full marathon is exactly one lap of the reservoir, on well made tracks going through the forest, not unlike the terrain at Fewston but definitely on the distinctly hilly side of undulating. Conditions were perfect, with a foggy and frosty start giving way to a sunny but cool and still day. My three aims were to (mostly) enjoy it, to beat last year's time, and to only walk some uphill stretches but none of the flat or downhills. I succeeded in all three. I had hoped to get round in 04:30 but it wasn't to be, however I was happy enough to shave a good six minutes off my time. I took advantage of the sports massage on offer straight afterwards which really aids recovery. The marathon was won by a fellow Dutchie running for Tyne Bridge Harriers. I can honestly recommend the weekend, with 4 races to choose from there is one to cater for everyone making it a good family event.